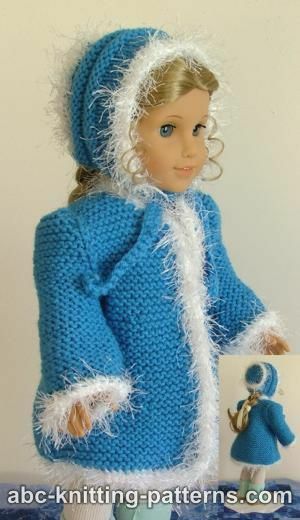 The fur-trimmed coat is a classic winter staple that can match a variety of doll outfits, whether you're going for a modern look or trying to imitate a more historic style. 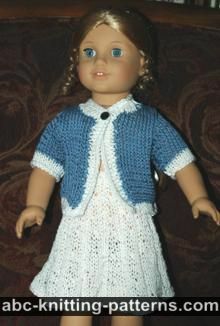 The coat is knitted with garter stitch. 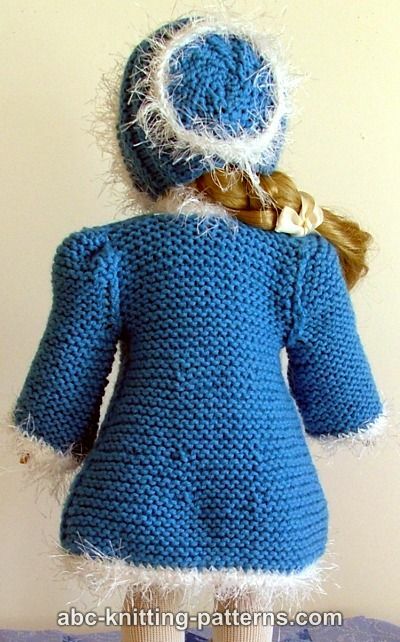 The back, right front, left front and sleeves are each knitted separately from the top down. They are joined after. 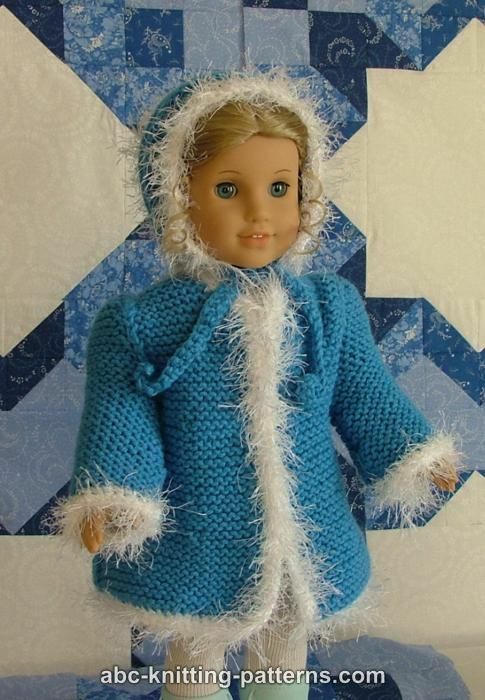 The center fronts, hem and sleeve edges are finished with Faux Fur yarn using crochet. If you prefer a knit finish, I explain how to do this in the Finishing section. Crochet has just always seemed easier to me. 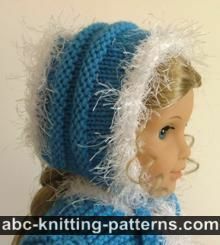 The pattern for the matching hat is also available. Materials: Red Heart Super Saver 100% acrylic aran weight, color Blue, 333 m (364 yds)/198 g - 1 skein. Fun Fur by Lion Brand (100% polyester), 64 yards (59 meters)/ 50 gr, color White – 1 skein. Gauge: 16 st x 27 rows = 4" x 4" (10 x 10 cm) in garter st.
Edge/selvege sts: slip the first st knitwise, purl the last st in a row. Row 2 (WS): Sl 1, k28, p1. Repeat rows 1 – 2 ten more times. Row 24 (WS): Sl 1, k26, p1. Repeat row 24 four more times. Row 30 (WS): Sl 1, k24, p1. Repeat row 30 four more times. Row 36 (WS): Sl wyif, k22, p1. Repeat row 36 four more times. Row 43 (RS): Sl, k16, p1. Repeat row 43 fifteen more times. Row 2 (WS): Sl 1, k15, p1. Row 24 (WS): Sl 1, k14, p1. Row 30 (WS): Sl 1, k13, p1. Row 36: Sl 1, k12, p1. Repeat row 36 five more times. Row 43 (RS): Sl 1, k9, p1. Repeat row 43 nine more times. Row 54 (WS): Sl 1, k5, p1. Repeat row 54 ten more times. Bind off. Row 24: Sl 1, k14, p1. Row 30: Sl 1, k13, p1. Repeat row 36 four times. Row 42: Sl 1, k9, p1. Repeat row 42 ten more times. Row 53: Sl, k5, p1. Repeat rows 53 eleven more times. Row 2 (WS): Sl 1, k18, p1. Row 25 (RS): Sl 1, k12, p1. Repeat row 25 four more times. Rows 30-32: Sl 1, k10, p1. Row 34 (WS): Sl 1, k8, p1. Rows 36-37: Sl 1, k6, p1. Join shoulder seams. Set in sleeves and join side seams. Weave in all yarn ends. Sew on 2-3 metal snaps. 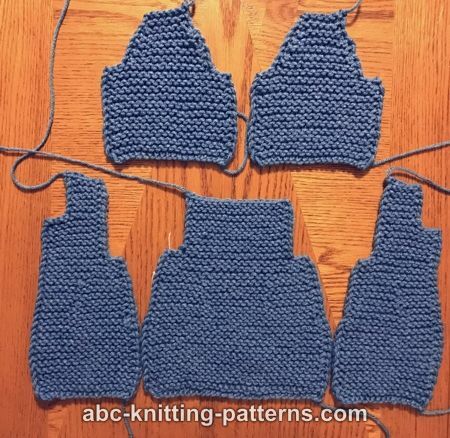 Starting from the center of the back neckline, attach Fan Fur yarn and work 2-3 rows of single crochet around all edges – neckline, front edges, hem. If you don't crochet, you can achieve a similar look by picking up the sts along the edges of the garment and knitting 2-3 rows of garter stitch. In the same way trim the sleeve edges. Pattern was updated on September 15, 2018. If you are budgeting your monthly expenses and most of your money is set aside to pay bills, you may be looking for inexpensive activities. Learning to crochet can be a very fulfilling hobby that will barely affect your finances because the cost of yarn is very low. 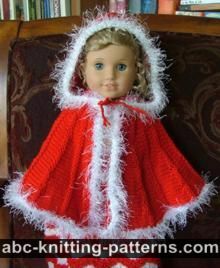 Crocheting can also help you save more money on gift expenses. 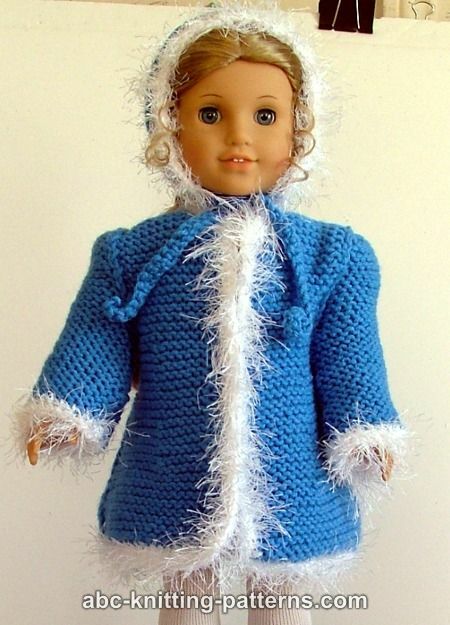 This doll coat, for example, would make a perfect child's birthday present which will certainly help with your budgeting. There are 26 total comments on this article. Re-read the direction- it says 48 ROWS, not sts! the pattern decreases to shape the back into the shoulder area and works out perfectly. It does not mention 48 stitches. The 48 is the row count at that point. I see how this is confusing. I interpret it to mean after decreasing continue to knit until you've established 48 rows. I finished this with difficulty - I found I had to re-read the words many times to understand. It would be helpful if there were stitch counts after the dec. The fuzzy stuff is crocheted, I think you could adapt by casting on w/fuzzy then changing to the yarn. Or pick up & knit. I did only one round of single crochet. it's done! You can pick up stitches along the edge and work 2-3 rows of garter stitch instead of crocheting. That line means to continue to knit without any decreases. I've tried to look up the conversion to overseas yarns. It was very confusing. The yarn suggested is a US #3 weight. According to the packaging, knitted on 4 mm needles, 22 stitches for 28 rows should give you a 10x10 cm square.